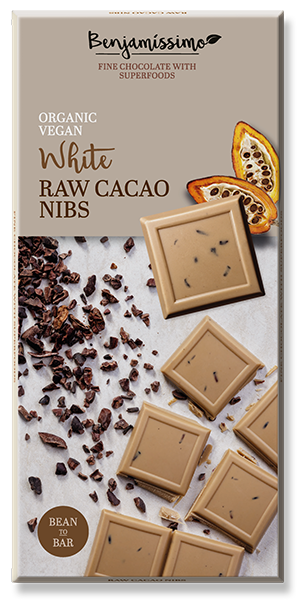 Raw cacao nibs are the natural, unprocessed source of chocolate. That’s why we decided to combine the delicious taste and health benefits of raw cacao beans with high quality chocolate. Enjoy the pure taste! Organic vegan dark chocolate with raw cacao nibs. Ingredients: cacao mass*, raw cane sugar*, cacao butter*, raw cacao nibs* (5%), sunflower lecithin*, Bourbon vanilla*. Cacao: 75% minimum. *From organic agriculture. May contain traces of nuts. Nutritional information (per 70g): Energy 1670 kJ (399 kcal), Fat 26.6 g, of which saturated 14.5 g, Carbohydrate 33.8 g, of which sugars 19.8 g, Protein 6.1 g, Salt 0.008 g.
The rose otto has been a real treasure from Bulgaria for centuries. Its aroma is full-bodied and complex, while in combination with chocolate, it puts your senses on a blissful journey. 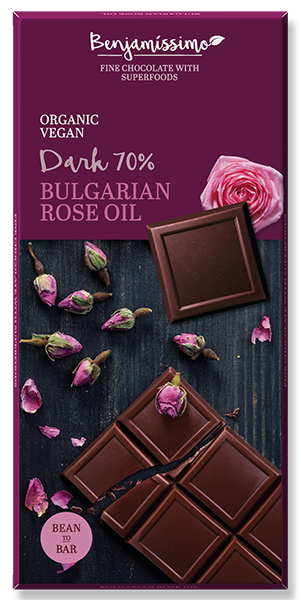 Organic vegan dark chocolate with Bulgarian rose oil. Ingredients: cacao mass*, raw cane sugar*, cacao butter*, sunflower lecithin*, Damask rose essential oil* (0,004%). Cacao: 70% minimum. *From organic agriculture. May contain traces of nuts. Nutritional information (per 70g): Energy 1651 kJ (395 kcal), Fat 26.0 g, of which saturated 14.2 g, Carbohydrate 34.4 g, of which sugars 20.8 g, Protein 5.9 g, Salt 0.007 g.
In this bar we bring together two exciting ingredients: crunchy chia seeds and refreshing grapefruit oil. This extraordinary combination will surprise you in the most pleasant way. 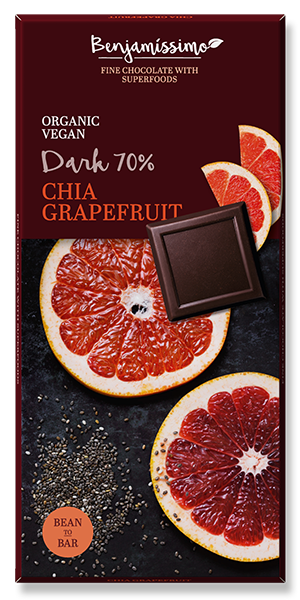 Organic vegan dark chocolate with chia seeds and grapefruit oil. Ingredients: cacao mass*, raw cane sugar*, cacao butter*, chia seeds* (2%), sunflower lecithin*, grapefruit oil* (0,1%), orange oil*, lemon oil*, Bourbon vanilla*. Nutritional information (per 70g): Energy 1639 kJ (392 kcal), Fat 25.9 g, of which saturated 14.0 g, Carbohydrate 33.7 g, of which sugars 20.4 g, Protein 6.0 g, Salt 0.007 g.
Mint and maca harmonise in every way. 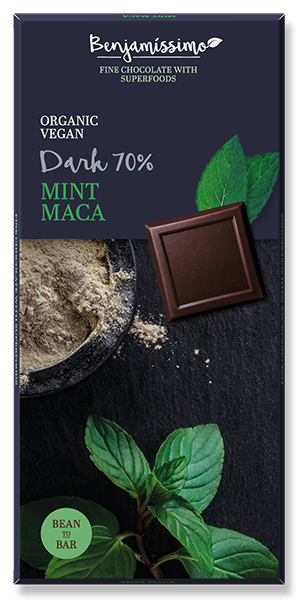 The freshness of mint and subtle caramel-sweetness of maca merged with dark chocolate, create an amazing experience for the senses. Organic vegan dark chocolate with mint and maca powder. Ingredients: cacao mass*, raw cane sugar*, cacao butter*, maca powder* (2%), sunflower lecithin*, peppermint essential oil* (0,03%). Cacao: 70% minimum. *From organic agriculture. May contain traces of nuts. Nutritional information (per 70g): Energy 1630 kJ (390 kcal), Fat 25.8 g, of which saturated 14.0 g, Carbohydrate 33.7 g, of which sugars 20.4 g, Protein 5.8 g, Salt 0.007 g.
Classical, yet also innovative, a truly heavenly combination of roasted almonds, sweet mulberries, and coconut blossom sugar, which adds a light caramel note. 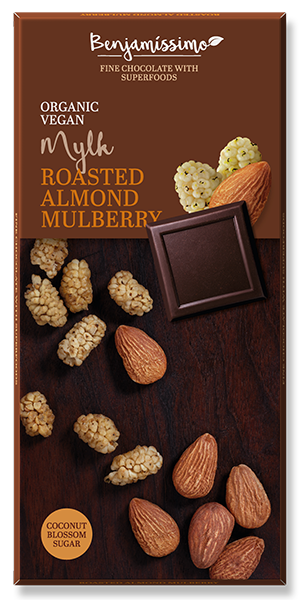 Organic vegan mylk chocolate with roasted almonds and mulberries. Ingredients: cacao mass*, dried coconut blossom nectar*, coconut cream* (12,5%), cacao butter*, roasted almonds* (7%), dried mulberries* (5%), almond paste (3%)*, sunflower lecithin*, Bourbon vanilla*. Cacao:50% cacao solids. *From organic agriculture. Nutritional information (per 70g): Energy 1607 kJ (384 kcal), Fat 25.9 g, of which saturated 14.6 g, Carbohydrate 32.2 g, of which sugars 22.3 g, Protein 5.6 g, Salt 0.004 g.
Matcha is the queen of teas and has been used in Japan for centuries during ceremonies as well as in preparation for meditation. Enjoy one of our finest flavours! Organic vegan white mylk chocolate with matcha tea and lemon oil. 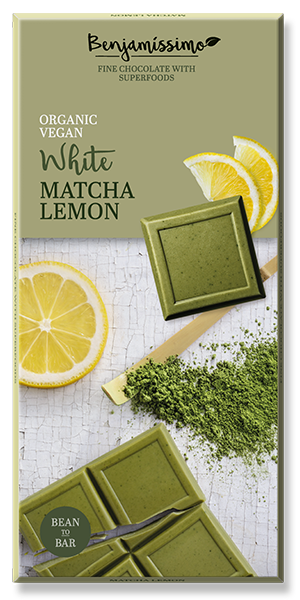 Ingredients: raw cane sugar*, cacao butter*, coconut cream*(11%), almond protein powder* (10%), matcha tea powder* (2,5%), sunflower lecithin*, lemon oil* (0,04%). Cacao: 35% minimum. *From organic agriculture. Nutritional information (per 70g): Energy 1717 kJ (410 kcal), Fat 29.5 g, of which saturated 19.6 g, Carbohydrate 31.7 g, of which sugars 30.7 g, Protein 4.5 g, Salt 0.002 g.
This is a blend of white chocolate vegan alternative and natural raw cacao nibs. An excellent example of how opposites can perfectly complement each other! Ingredients: raw cane sugar*, cacao butter*, coconut cream*(11%), almond protein powder* (10%), raw cacao nibs* (5%), sunflower lecithin*, Bourbon vanilla*. Cacao: 35% minimum. *From organic agriculture. Nutritional information (per 70g): Energy 1738 kJ (415 kcal), Fat 30.3 g, of which saturated 21.4 g, Carbohydrate 31.2 g, of which sugars 29.9 g, Protein 4.3 g, Salt 0.002 g.